So, Long time no update! I have finally got some more work done on this. I took off the Plexiglass on top of the control panel and and cleaned and polished that up a bit. I then, removed the punch, kick, jump stickers on the control panel. After I had my wife with her precision hands, exacto knife the artwork, I managed to get the new CPO on there and it looks pretty good to me! 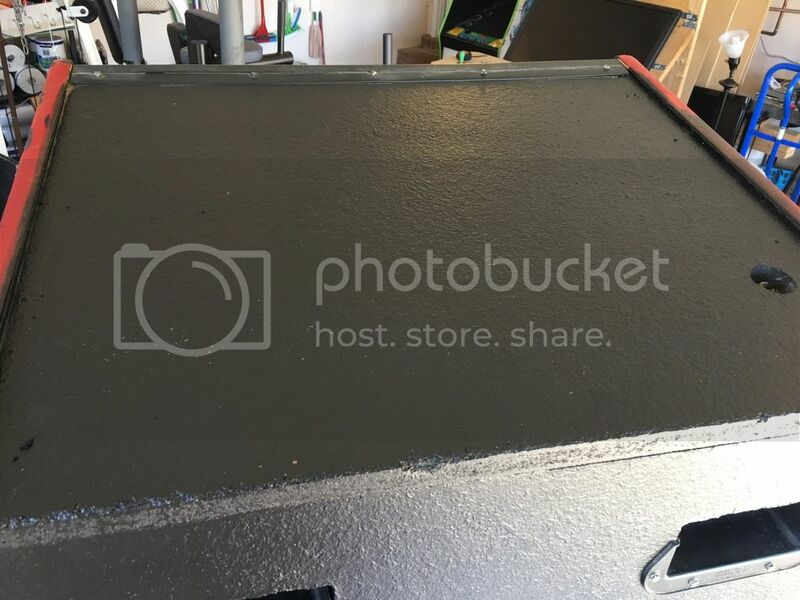 I ordered some new buttons to go in there, and that should really make it pop. Here it is without them. I also had the wife cut out the white space for the marque artwork, and it looks amazing! Sorry that my finger was in the shot, but I didn't notice that until I got to work this morning. 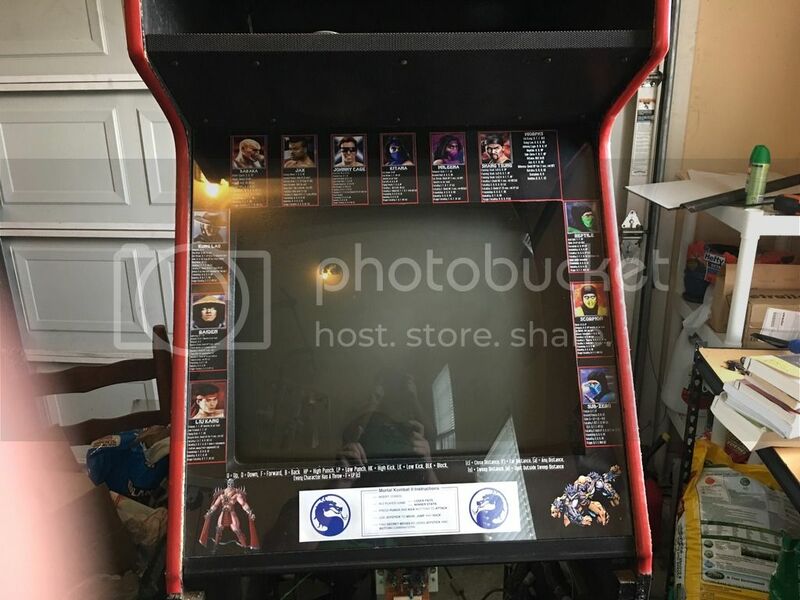 I just need to clean up the screws on the CPO, clean and paint the Coin door, replace the T molding, and track down why the player 1 down button isn't working, and I will be done with this project! So here is where I am at. I have the machine reassembled, and it looks awesome! However, looks aren't everything. Through game play, I have discovered that I only have Block, High Punch, and High Kick. 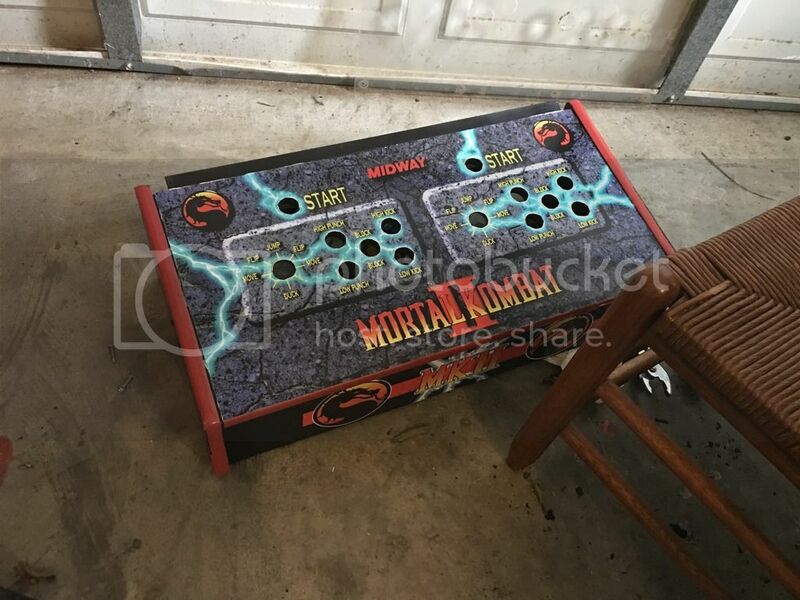 The Low Punch and Low Kick buttons just do the same thing as the High Punch and High Kick buttons. 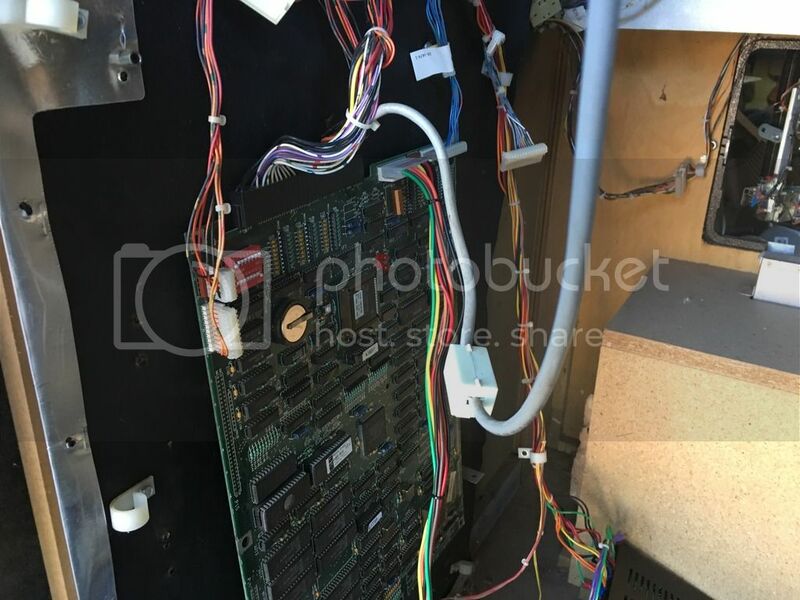 This along with the fact that player one down doesn't seem to be working has me to believe that I might have this stuff hooked up incorrectly or that the harness is wrong for the game. (I should note that they had converted this into a Rampage World tour when I got it). Here is a pic of the hook up from the Control panel to the PCB. Any ideas on what to try? I am almost through with this project, and the control issues are the last thing left to fix! I was really busy last night, so I didn't get a chance to work on it, but I did get a chance to take a few more pics of it. Another shot of the Control panel. A couple of the hanging PCB. I still need to get some PCB feet and put them in there. So last night I had just a few minutes to look at this and run over some diagnostics. After failing to put it into test mode, as the switch seems to do nothing, I looked at the hardware more closely. 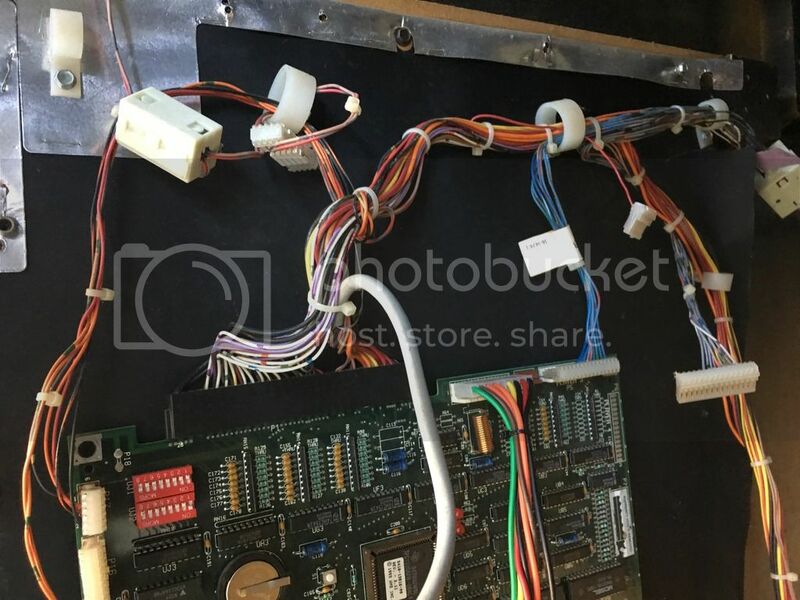 I took the suggestion of trying to swap out the two connectors on the harness, but that didn't work as the pin outs are a little different. So I decided to just start disconnecting everything until hings stopped working. So I unplugged the blue wired section from the harness, and nothing stopped working. Everything worked just as it had before. 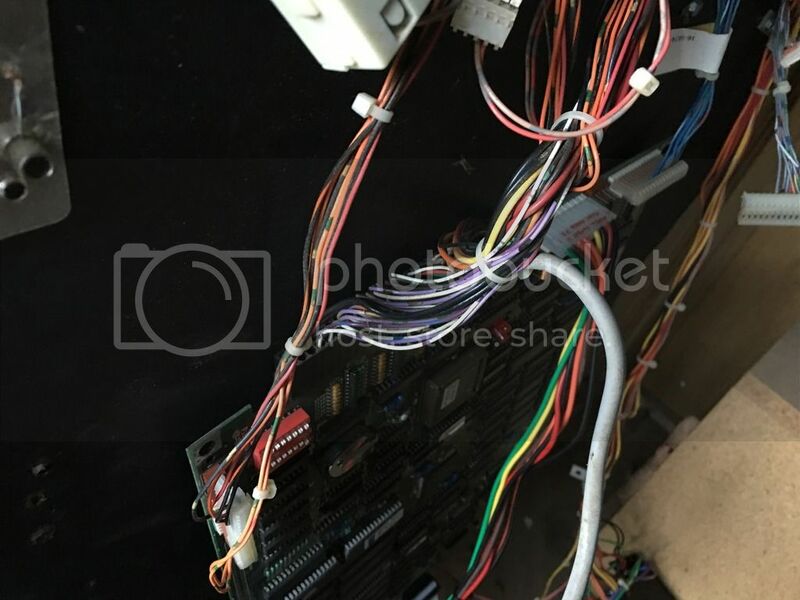 So I unplugged the purple wired section from the harness as well, and the only thing that stopped working was Player 2 start. 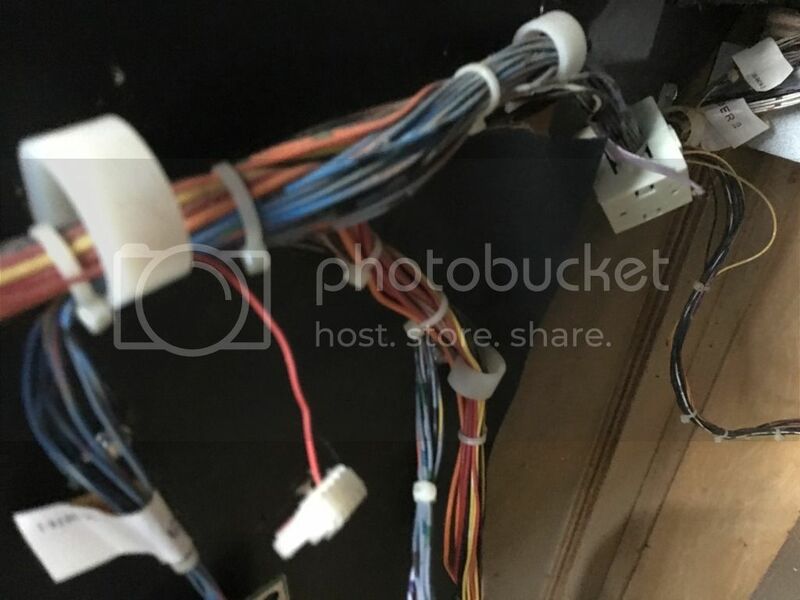 So I took another look at the wiring itself. 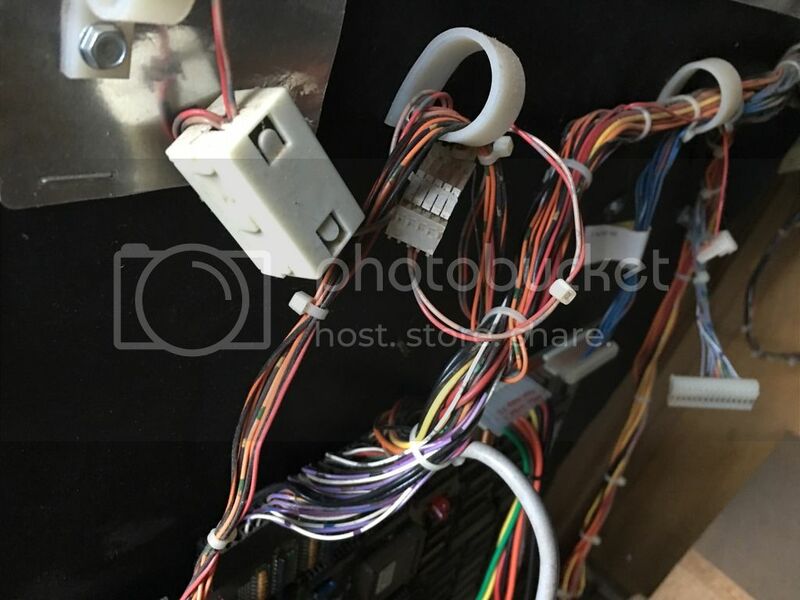 Looking closely at the wires, I noticed that in the rats nest of wiring on the controls, that they had cut several wires and spliced them into others. I assume that they did this to convert it. 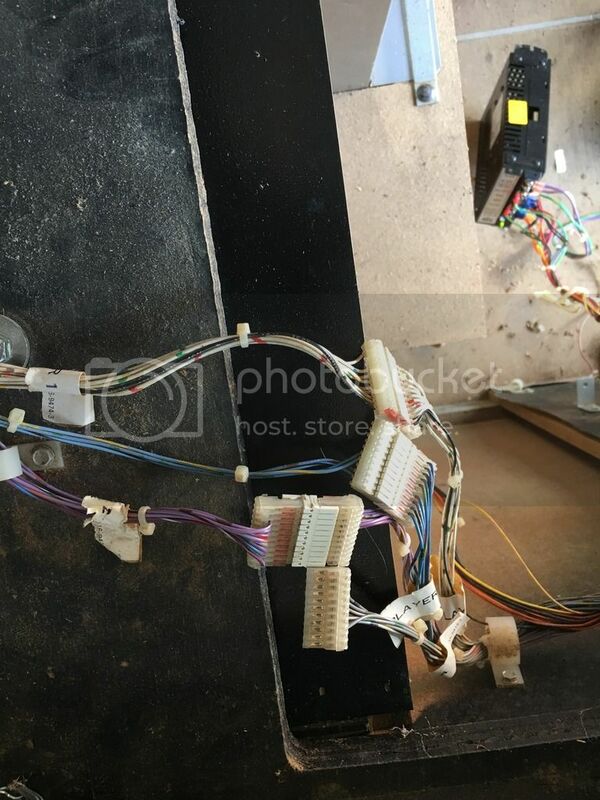 Now fortunately, the wires are all still there, I just need to connect them back together again. Hopefully I will get a chance to do that tonight. 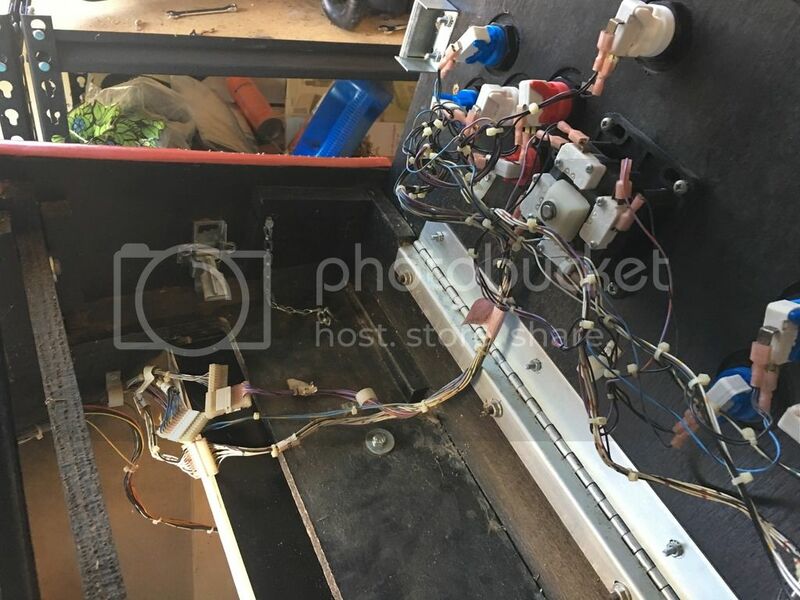 So I spliced the wires back together for the low punch and low kick, and swapped them back to the spots that they are supposed to be at. That fixed everything but the issue with the Player one down. I swapped out the switch with a brand new one wondering if that was the issue but it isn't. So then I followed the wire all the way to the PCB. 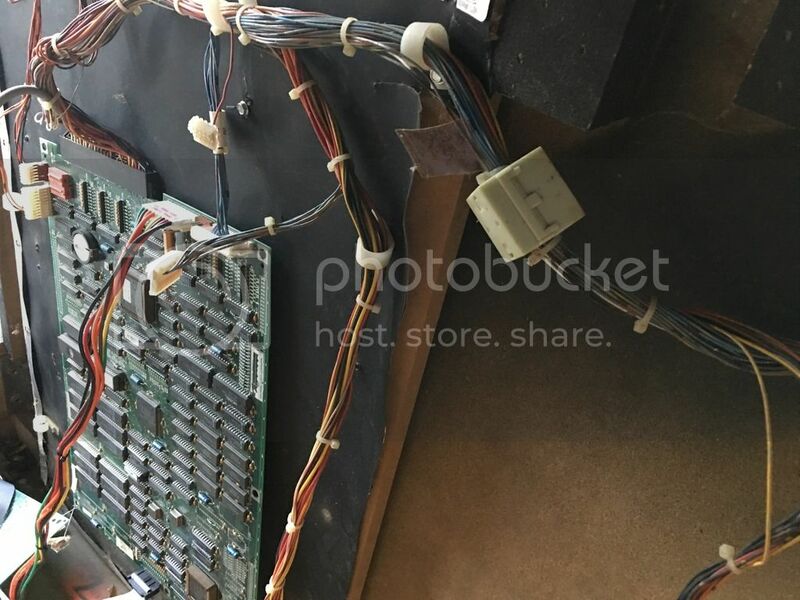 It goes into this little plastic box that I can't seem to open and then comes out to connect to the PCB via the JAMMA connector. I guess that I need to test the Jamma connector where the signal comes in to make sure that it is getting the signal and move from there right? 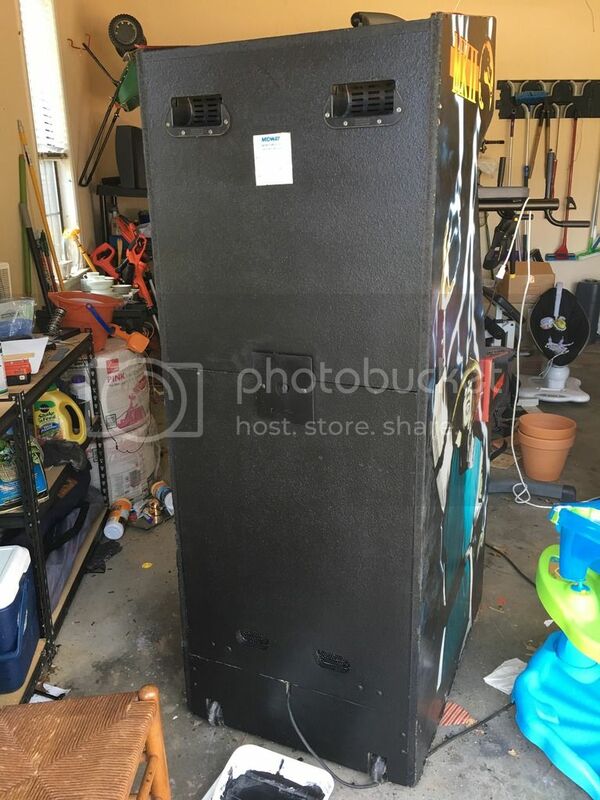 So, I want to paint the back and top of this cab. Should I use flat or glossy paint? Back of the cab? I would go flat... hides any and all flaws and every cab I have is flat black on the back. I stopped by Walmart on the way and picked up a small can of Canyon Black in a satin finish. Unfortunately, that was all they had that might work for me. I will give that a shot this week sometime and see if that doesn't make the whole thing look a 1000 times better. 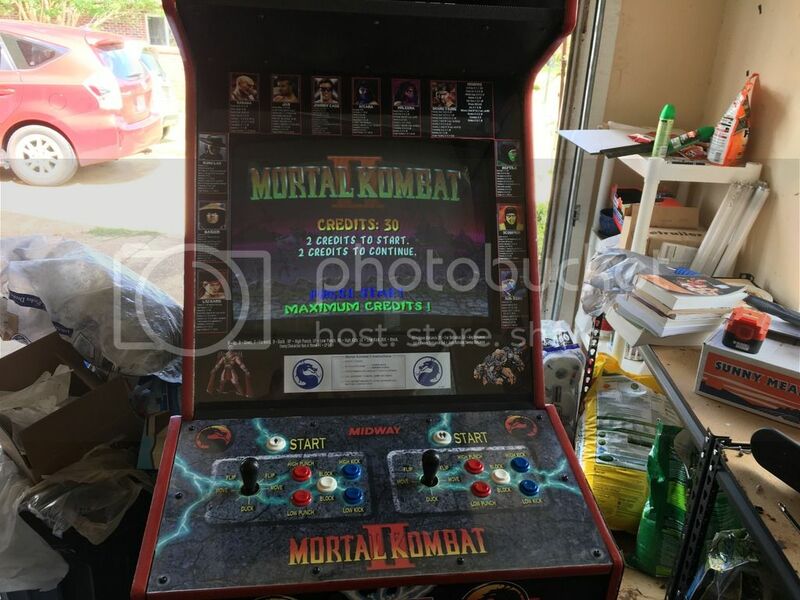 Every time I see an update to your thread, the Mortal Kombat movie theme runs through my head. Lol! Mine too! I start humming it when I walk by the machine every day. Satin finish looks the most natural in my opinion. I think you will be fine. Cool! Hopefully I will get a chance to paint it tomorrow! Here are some pics of the top and back after I painted them. They probably could have used a good sanding before hand, but I think that this would do nicely. So I am about to put some new ROM chips in this week, but before I do I have a question. Does anyone know what the Voltage should be coming out of the switching power supply? I put a new one in there, and it partially works. you should have -5v on the -5v rail , +5v on the +5v rail , and +12v on the +12v rail.